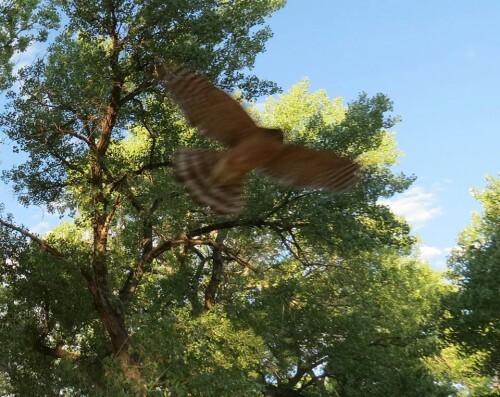 A Hawkish Encounter /Hawks Aloft Inc.
There’s nothing cuter than baby Cooper’s Hawks! These are ‘branchers’, meaning they have climbed out of the nest but are still not quite ready to fly! Mama Hawk is standing guard nearby. These babies are in a nest in the Bosque that I monitor in spring and summer. 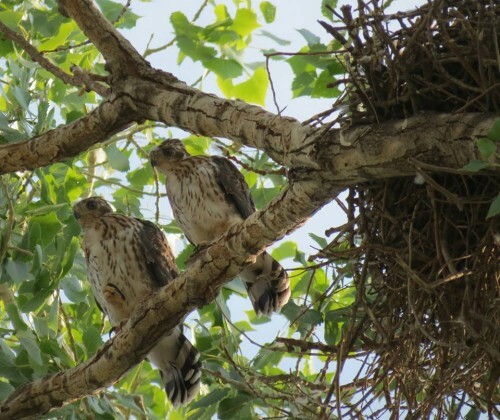 Immature Cooper’s Hawks have vertical brown streaks on their breast, a pale nape with thin streaking, and a brown back with white spots, as well as a rounded tail which is banded with a broad white terminal band, and yellow eyes. 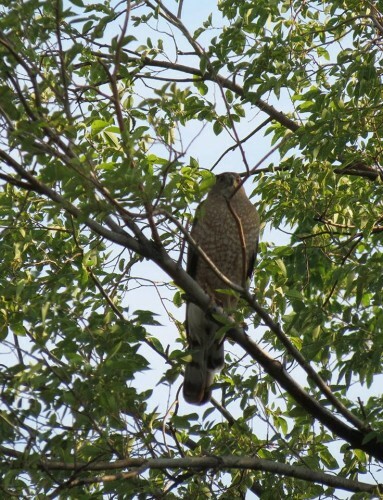 Adult Cooper’s Hawks have a slate gray back, a dark gray “cap”, a long thin, rounded, banded tail, and red eyes. Here’s Mama Cooper’s Hawk, standing guard over her babes and not liking me being nearby. Like all mothers, she is very protective of her babies. Understandably his photo is blurry! I took my leave of the nest!